There are rare moments throughout a tour of Walt Disney World, when the beauty of a scene is marveled at, but the tale behind the astonishing sight goes unnoticed or explored. 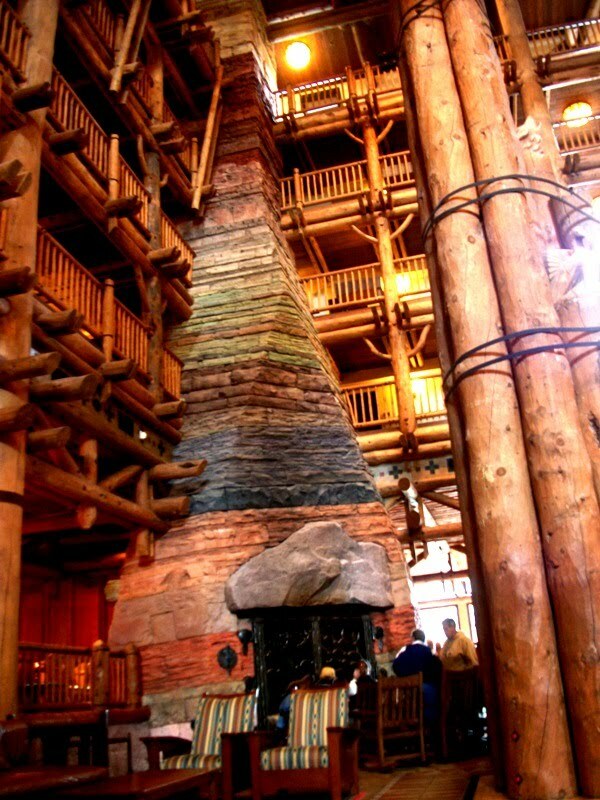 One such scene presents itself in the Grand Canyon Fireplace, climbing through the lobby of the Wilderness Lodge. While the vivid colors of the mighty eighty-two foot column are awe-inspiring, the story of the fireplace is just as remarkable. The Grand Canyon Fireplace, as the name implies, mirrors the rock and fossil-filled layers of the Grand Canyon. With bands of rock dating back almost two billion years, it is well worth the time to explore the intricacies of each layer of the fireplace. From the second floor lobby all the way through the seventh floor, the individual layers are peppered with remnants from their respective eras, from trilobite traces, to clam and coral remnant, and even a cephalopod or two, dating back to long before the dawn of the dinosaurs. The colorful strata of rock run the gamut from hardened ash in the Vishnu Scist, to limestone, sandstone, shale, and even basalt, to name just a few. While the fossils, rockwork and echoes from earlier ages in the Grand Canyon Fireplace are only representative of the true layers found in the national treasure that is the Grand Canyon, the Wilderness Lodge features a number of displays that are a treasure trove of relics, remains, and rocks. Displays near the fireplace appear on each level of the resort showcase collections of fossils geological era information for the inquisitive. While the fossils themselves have not been removed from the Grand Canyon, they are accurate to the paleontological genus. While sometimes a hearth is just a hearth and a rock is just a rock, often times, especially in Walt Disney World, there is almost always more to the narrative. In the case of the Wilderness Lodge’s Grand Canyon Fireplace, the history and mystery of planet earth is locked away within its towering layers, just waiting to be discovered.